Adam Molai Foundation team handing over goods in Bikita. 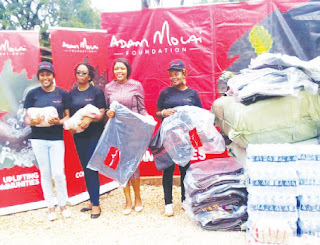 BIKITA – Adam Molai Foundation, a non-profit making organisation dealing with the uplifting of communities has donated food, blankets and other goods to victims of CyloneIdai in Bikita. 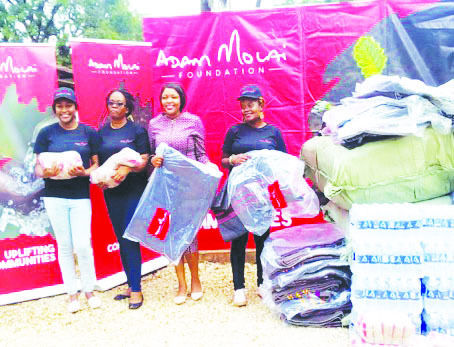 The donation was done on Wednesday last week and the goods which included 500 blankets, cases of sugar, sugar beans, rice, flour and sanitary pads were left with Innocent Matingwina at the District Administrator’s office. After the Bikita donation, the Molai Foundation team proceeded to Chimanimani where they were going to make another donation. Seven people were killed in Bikita and 6 370 others injured. Hundreds are homeless after houses collapsed due to the incessant rains that pounded the area for two consecutive days. Matingwina who is the chairperson of the Civil Protection Unit thanked the Foundation and said more support was still needed. NomaguguMatibiri, the programs director at Adam Molai said their thoughts are with the displaced and affected families. “The intervention is not about the quantities of assistance but the quality of everyone’s response,” said Matibiri.